Celebrating 50 years of business in 2015, Gable Sporting Goods has become a destination location in the Atlanta, Georgia area, from athletic wear and outdoor apparel, to a robust gun and archery shop. With over three decades of experience in team and uniform sales, Gable has made inroads to the amateur athletic market within a 25 mile radius of their brick-and-mortar headquarters in Douglasville, Georgia. 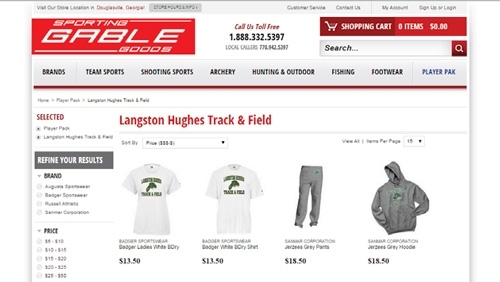 Blaine Gable, the third generation of the Gable family involved in the operation of the business, has worked to bring Gable Sporting Goods into the E-Commerce era. Working alongside Celerant Technology and their Command Retail software offering, Gable implemented a single point of sale and E-Commerce platform back in 2012. But with team sales being a considerable revenue stream for the company, Gable needed a specific solution to meet the demands of parents and coaches in his market that could integrate with the company’s E-Commerce website. Looking for an online team sales platform, Gable researched standalone options that allowed him to setup a shop for his customers to visit. But Blaine found a couple of flaws with these systems. First, online traffic was taken to a third-party website and away from the company website. Secondly, a monthly fee was charged as a percent of sales through the third party portal. Not satisfied with losing web traffic and paying a monthly cut of his team sales, Gable found another solution: the Player Pak from Celerant, which builds a team sales platform with his E-Commerce website, creating a seamlessly integrated system for point of sale, E-Commerce and team sales. With the powerful combination of these three platforms put in place at the beginning of 2014, Gable Sporting Goods now features a team sales portal built right into the main website – all with a single, upfront investment. With the real-time visibility of the entire business now available through a single platform, Gable Sporting Goods has now turned its focus to leveraging other markets through team sales. The company currently takes orders from local car dealerships that require employees to purchase branded shirts, as well as police departments looking to offer tactical boots and apparel. With this single, robust online presence, Gable has seen a noticeable increase in traffic and sales.